Yesterday on Twitter, Dr. James Norwood (@JRNorwood) posted a short tweet entitled "Flipping Bloom's Taxonomy". The intriguing title led me to click to the link that led to his Teaching in the Middle blog post about a blog post he had read on Shelley Wright's blog, Powerful Learning Practice. The gist of the blog post was Shelley's idea to start with the creating cognitive process and "flip" the pyramid so it looks something like the image below.. She states, "Here’s what I propose. 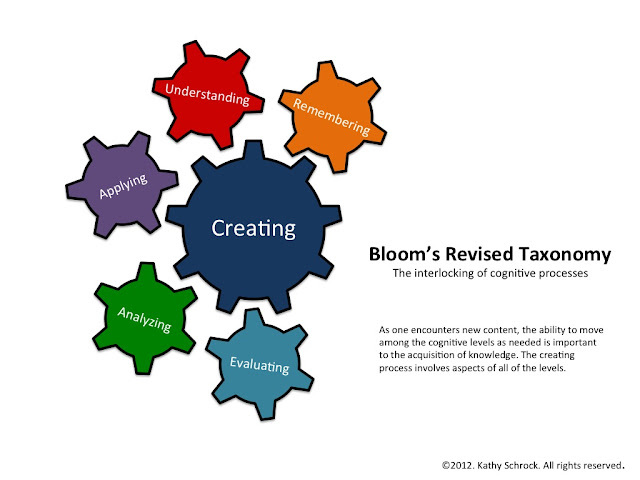 In the 21st century, we flip Bloom’s taxonomy. Rather than starting with knowledge, we start with creating, and eventually discern the knowledge that we need from it." I do not think I agree. I do promote the use of problem, project, inquiry, and/or challenge based learning models to allow students to take control of their learning. However, I truly believe students need to have at least some knowledge-base in a topic before they can analyze, evaluate, or create something with the content at hand. In addition, during the acquisition and creation of new knowledge, learners move up and down the cognitive levels as they need to. Shelley states that she (and many others) were taught that "Blooms becomes a “step pyramid” that one must arduously try to climb with your learners." I am glad my professors at Rutgers College of Education did not teach it this way! I am a big fan of the pedagogical model and thinking about the different levels has always allowed me to plan activities at any (or all) of the levels at any point in the teaching and learning process. I never thought of Bloom's Taxonomy as a series of steps to the top. However, I do agree with Shelly that the pyramid shape, with the little tip left for creating, may confuse some educators into thinking only some students are capable of getting to that level or creativity is a small component of the cognitive skills process. I gave it some thought, and developed a different graphic to represent the taxonomy based on how I utilize it. Take a look at the image below and let me know what you think! Wright, Shelley. 15 May 2012. "Flipping Bloom's Taxonomy". Blog post. Powerful Learning Practice.